One of the exhibits on CeBIT 2008 was Samsung’s new color laser. 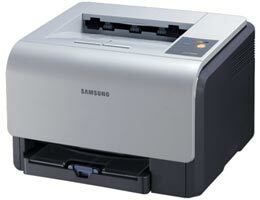 The company claims the Samsung CLP-310 to be the world’s smallest color laser printer. Apart from size, the CLP-310 stands out with its quietness – the company promises an ultra-low noise level of 46dB. The printer come cased in both traditional grey and stylish black, a new option aimed at sexing up the image of Samsung’s printers. It remains to be seen, however, whether consumers will bite. Although prices are not set, a standard CLP-310 is estimated to cost around 200 GBP (around $400), with networked and wireless options costing extra. Traditionally, lasers repay their higher purchase price with cheaper consumables, but few home users will print with Samsung toner enough pages to make the CLP-310 economical. What’s more, while the CLP-310 may be the “world’s smallest color laser”, it’s no smaller than a standard color inkjet, and at only 4 color pages per minute it’s not far ahead on speed either. A few test prints on the sample units at Samsung’s CeBIT stand indicated that print quality is fine for everyday use. There was, unfortunately, no glossy paper on hand to test promises of photo-quality prints, but plain paper output was more than satisfactory, with rich, bright colors and crisp, solid blacks. The mechanism was certainly on the quiet side, as much as the expo qualifies as a place to measure sound levels. This entry was posted on Wednesday, March 12th, 2008 at 6:36 am	and is filed under laser, printer, Samsung. "Inkjet Printer Can Now Make Solar Cells"